The Boston Regional was held this weekend at Agganis Arena. School teams, with help and support from mentors and sponsors, built their robots in a 6 week week time span from a common kit of parts and set of rules provided by FIRST. FIRST is an acryonym for: For Inspiration and Recognition of Science and Technology. The teams enter their robots with an eye on reaching the national championship in Atlanta this April. 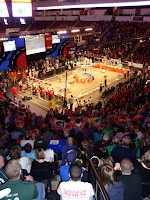 The competition, or as teams call it, "the game" or "sport for the mind" is different each year and is designed by Dean Kamen, Dr. Woodie Flowers, and a committee of engineers and other professionals. More information about this year's game can be found here.